After a week we catch up with Leticia, the Mother of our friend, Carlos, from GE. She is a lovely lady who, thankfully, speaks good English as our progress in learning Spanish is not at all great. Some of our packages have arrived but some that should have, have not, so more chasing up to do. Leticia accepted our invitation for dinner on the boat but it wasn't until I took the dingy in to pick her up that I found out she had not been in a dingy and barely ever on a boat. Needless to say, at 70, she was a little apprehensive back as brave as ever managed to get into the dingy, onto the boat and, after a few drinks, reverse the process. It is wonderful to meet and talk with someone truly local. Before leaving she invited us to visit and meet her daughters for dinner, promising some local food and drinks. On Friday evening, 5pm, Leticia picked us up for the short drive to her daughter, Vivian's, 4th floor apartment. On the way we are treated to some more background on San Juan and even pass the house where Leticia was born. In one of the emails that Carlos had sent us he mentioned “you must meet my sisters, they are a real blast”. Not wrong, both Vivian and Brenda are true larger than life Puerto Ricans. It was a great night. Leticia showed Sasha how to make tostones from plantains (looks almost identical to a banana but is used more as a vegetable in cooking). The plantain is sliced, fried to soften, mashed in a small bowl shape (using a special wooden utensil that Leticia gave Sasha) and filled with spiced up crab meat. That was entrée. Followed by very tasty chicken rice with a bean based sauce. Absolutely mouth watering. Editors Comment: There is a special name to this Puerto Rican favourite dish, but neither Roger nor I can remember the name. One would think that Spanish name - “Arroz con Pollo” would do the trick, but no. When rice and beans are mixed together the Puerto Ricans would call ir “casamiento”, so I guess the more descriptive name would be – “Casamiento Con Pollo”. Also, I learned from Leticia the spice base of many dishes in Puerto Rico will be coriander, peppers, oregano and garlic. She used a special Sofrito Criollo spice mixture for tostones crab filling, which I later purchased for use on the boat. Then the home made “Cochita”, a sort of rum eggnog. Egg yokes, sweet coconut cream, condensed milk and rum, what a way to finish off a meal. Before leaving we arranged to take all sailing next Saturday. Today is a one year anniversary, I retired one year ago 19 May. Oh how fast the time goes but a lot has happened and we are doing pretty much as planned. I think the time for reflection will be on a couple of weeks, the first anniversary of our cruising. It is Sunday morning, the waters of San Juan Bay harbour are glass. This is the first time since arriving two weeks ago. Sasha is battling the PC again as one of the navigation databases has chucked a wobbly. I am giving the bbq a birthday when I hear a plane close by. Nothing too unusual as we are right next to the airport only the plane is on the water side of us not the land. It's a twin engine sea plane, passes about 20m away at about half mast height and touches down about 100m away. Really neat! As part of our tourist activity we decided to hire a car and visit a nearby national park with mountains to over 1000 metres and the most northern tropical rain forest in the world. El Yunque is less than an hours drive and Gigi and Lulu joined us for a days exercise walking some of the trails. We set off a bit after 7 and arrive, without getting lost, just after 8 to find the visitors centre still closed so drive further up to some of the walk trails. The big tree trail follows the path of a mountain stream and is about 4km, a good starter. On a beautiful clear warm morning we began exploring El Yunque. Little did I know we would end up walking 15km including the summit trail that rises 200m. It was however very, very worthwhile, a thoroughly enjoyable day with lovely company. We were so very lucky with the weather, getting only a little wet in an afternoon shower. On Saturday Vivian and her son Orlando spent the day on Ednbal with us. We sailed down the harbour to the entrance opposite El Morro Fort and the city wall. Even our visitor residents of San Juan were impressed with the sight from the ocean side. Sasha prepared Aussie meat pie with starters of Nori rolls. It was a great day and I think our visitors really enjoyed. Over the next week or so we became very anxious about packages that were supposed to have been delivered via the US postal service, priority post. In theory they should take 2 to 3 days but after almost 2 weeks only one had turned up. On top of that our wiz bang ceramic chefs knife we had sent for resharpening from George Town in the Bahamas 6 weeks ago, had not been received by the company. On the bright side, medication sent by my sister in law, Gloria, had arrived from Australia 2 days after it was sent! Eventually, after a lot of help from Leticia and Vivian negotiating with the post office staff, all packages arrived by Saturday the 2nd of June, our one year anniversary of cruising. It just seems incredible that we left Melbourne Florida to head north a year ago. We have since sailed over 6000 nautical miles, seen some wonderful places, met some incredible people and thoroughly enjoyed fitting out our Ednbal for long term cruising. It really does feel like we are living a dream. Not to say there haven't been a few issues, the most frustrating is the organisation of financial matters in Australia from afar. During our time in San Juan we spent many evenings with Gigi and Lulu, sometimes dinner on Roi Soleil sometimes on Ednbal. We resolve to leave at the same time for the San Blas Islands off the East coast of Panama, about a 950nm sail that will take around a week. Finally the right “weather window” opportunity comes up with no tropical low pressure systems and 15 to 20kn Easterly trade winds over the Caribbean Sea for a week or so. At 8am on Monday June 4th, 2007 we up anchor and sail out of San Juan harbour in company of Roi Soleil. Out in open water we have 15 to 20knots almost dead astern and soon have Ednbal in a goosewing sail formation comfortably making 6kns. 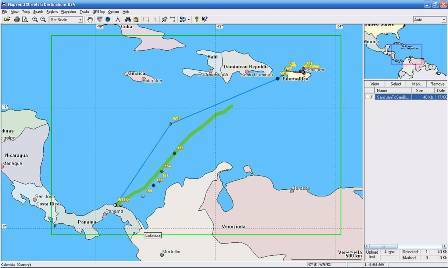 The route that Sasha has entered into the chart plotter takes us to the Western end of Puerto Rico through the Mona Passage between Puerto Rico and the Dominican Republic passing East of Mona Island into the Caribbean Sea, to a way point mid way (15 degrees North, 75 degrees West) then on down to San Blas. 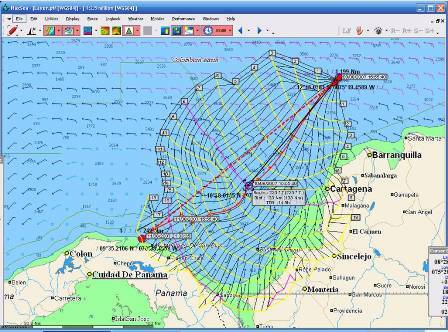 Based on our initial speed the chart plotter says we will be in San Blas in a week! Just on night fall we turned into the Northern end of Mona Passage to find the wind dying out and a 2kn current against us. Before long we are motoring along side Roi Soleil. Fortunately the wind began to build from the East again and after a couple of hours we were sailing again all be it in a very lumpy sea. By morning we were near Mona Island and at about 8am changed course 15 degrees to the West to put us on a course of 247 degrees, a mere 450nm to our next way point in the middle of the Caribbean Sea. Gigi and Lulu were further south of us and out of sight although ibi regular radio contact. The wind was 15 to 20kn, 20 degrees off the aft, port side. Two days later as I write this it is still the same, peaking to 25kn. So this is what trade wind sailing is like, fantastic. Before long we settle into the routine of sailing a longer passage. Shifts during the night and naps during the day for fatigue can be dangerous. Unfortunately Sasha is not well, she has a headache that just won't go. Over two days various pain relievers give temporary respite until finally on Wednesday afternoon she starts to come good. It may seem quite simple to sail the oceans blue and in many ways it is but there is also considerable concentration and the need for alertness to any issue or potential problems. We do not have a strict watch arrangement and with Sasha not well I take most, we have been having some problems with our Victron Phoenix 120 amp battery charger. For some reason it doesn't always start charging when the generator is run up. Often it requires multiple restarts before it comes good. While under way, with the added load of the auto pilot! navigation lights and radar the generator is required twice per day for battery charging. It is still under warranty and we have emailed the manufacturer but as yet have had no meaningful response. Today, Wednesday, we decide on a light lunch, rice crackers with cheese, tomato, gherkin and ham. Rice crackers slide very easily on plates, especially slightly dished, so it is not easy to make up a plate full of lunch, some ingenuity is required, especially in 20kn of wind and a rolling sea from the aft quarter! But I always like a challenge. Firstly I put the large wooden cutting board ( 600mm by 400mm by 25mm) on the gimble mounted stove top. Then stretch plastic food wrap as tight as a drum over each of the two plates to provide a flat, less slippery surface to place the rice crackers on. Next put the plastic cutting board on a non skid mat on the bench to cut the toppings for the crackers. Meanwhile Sasha is in the cockpit keeping watch and worrying her headache is from alcohol withdrawal thing there is no way we will have crackers and beer for lunch. All is going well as I put the finishing touch, a little pepper, on the cracker. I kneel down and open the fridge door (it is almost at floor level under a bench adjacent to the stove) to get two beers in preparation for triumphant entry to the present lunch to the admiral in the cockpit when!!!!!!!! *****##### I held the fridge door open not realising I had it against the stove which stopped the stove swinging on its gimble. Next minute the big wooden cutting board, with two plates of crackers, flew off the stove, hit me in the lip and sent crackers and toppings all over the floor. I was not happy! A big mess, all to be thrown over the side, tomato stains on the mat and a fat lip. I am proud to say that in the true spirit of my quadriplegic son “never, ever give up” Grant, I cleaned up and repeated the process, always good to have a practice run! And no, no photos were allowed! There always issue, things to attend to. The freezer has been playing up again. Whenever the battery voltage gets a bit low and there is a high current draw that takes the voltage at the distribution panel even lower the compressor stops. A few minutes later it restarts but the freezer has not been keeping as cold as it should so I don't want the compressor cutting out unnecessarily. With some spare cable I made up two leads, positive and negative, to run direct from the battery fuses to the compressor, effectively in parallel with the existing circuit from the distribution panel but a much shorter run with no other equipment connected. Of course the compressor is buried in the bottom of another cupboard so I empty that out, connect the additional cables and run them to the battery fuses mounted in the engine compartment. Hey presto it all works but still the freezer is not getting any where near as cold as it used to. That will require further investigation once we reach Panama. Tonight, Thursday, we are flying! The Easterly wind has picked up, we are still on our 230 course, so have the wind, at times over 30kns, off the aft port quartern in the middle of the Caribbean Sea.. With 3rd reef in headsail and main the GPS records a maximum speed of 9.2kn. Mostly with wind 25 to 30kn we are sailing 7 to 8kn, it is exhilarating. A dark night, moon hidden by cloud, a beam swell of at least 3m ( standing in the cockpit I cannot see over the crests, down in the trough it is completely black. I was on 8pm to midnight and it continued through Sasha' shift and didn’t ease off until mid morning. In 12 hours we covered 88 miles. It was surprising hour little Ednbal heeled or bounced around, either that or we did not notice as we were enjoying it too much! Amongst the array of electronics and software we have on board is the route planning navigation package the Sasha uses, curtisy of my son Grant, called MaxSea. Within MaxSea there is a subsystem called route optimisation. This takes in data contained in “grib” weather files we receive via email each day over our HF radio. The grib files contain forecast information, wind strength and direction, current strength and direction etc for the area we are sailing in. MaxSea is connected to our GPS so automatically has our current position. Sasha has downloaded Ednbal's (Beneteau 393) characteristics into MaxSea and with a couple of mouse clicks MaxSea then performs a “route optimisation” from our current position to the remaining way points in our route. Sometimes, sitting in trade winds for example, it is reasonably obvious but at the moment there is a small low pressure system right in our path to Panama. There are no high winds, although revolving, there is now wind for an area about 100 miles in the middle. The system is predicted to move so each day Sasha downloads the grib file and “re-optimises” the route. It works very well, to the extent that for most of the voyage we have wind off the aft quarter (we have to jibe a couple of times) and current with us. Our friends, Lulu and Gigi, on Roi Soleil, who have been cruising for 25 years are really impressed! Saturday morning reveals lighter wind and with Sasha feeling that her headache has finally gone, she decides it is bread and cake baking day. All goes well until a squall comes over us and in no time the wind is back up to 25kns. I shorten sail as she attempts to hold bowls and ingredients from skating all around the galley and saloon. Soon it is pouring rain in almost no wind so we get the liquid soap and have a shower in the warm tropical rain, fantastic. The bread and cake work out well and before long it is beer o'clock and sundown. By Saturday we are starting to feel the effects of the low pressure system with diminishing winds and in the early hours of Sunday the wind died forcing a few hours of motoring. After daybreak there is a little wind and once it reached 8kns we decided to set the APS (asymmetrical spinnaker or gennaker) and fly it most of the day, with wind up to 17kn, until late afternoon when again the wind died, and, although we had over a knot of current with us, we motor again for 3 hours until the wind again comes up. There is little better than moving on an increasing breeze after hours of calm. The sea is flat, like being on a river, there are tiny wavelets, and the boat does not move or rock around at all. Another beautiful nights sailing at a steady 5kn. By Monday morning we have some 80 miles to go, won't make it by night so we need to have a very slow day. As the wind dies we again fly the APS until early afternoon before we are becalmed again with 60 miles to go. Lulu and I confer over the VHF and decide to start motoring slowly, less than 4kn to arrive after daybreak Tuesday. Monday night was purposely slow, 2 to 3 knots. The RADAR showed numerous squalls of rain but they all missed us until just after daybreak and then there was rain with little wind. Gigi and Lulu had some more sail trouble, their jib furled had become stuck with a halyard becoming caught at the top. At least they were able to get it in but could not put it out. By daybreak they were 4 miles behind us so we reduced sail to only a small part of the mainsail while they caught up. We motored into San Blas together and a friend of theirs came out in a dinghy to “pilot” them in while we followed. Unfortunately there was more talking than piloting and they ran aground. We put a line from Ednbal and managed to pull them free, a little embarrassing. Archipelago De San Blas is made of a large number of small islands, mostly a few hundred metres in diameter and covered thick with coconut palms and other tropical plants. They are inhabited by the local Kunas Indians, typically a family to an island. There is a small charge, $5 per month to stay and you purchase locally caught lobster, crab (huge things), fish (all for $1 each) if you don't want to catch your own, and locally grown tropical fruit (Mango 4 for $1). The water is warm, there are hundreds of coral reefs for snorkelling, it really does look like the real tropical paradise.